The Irish Ubuntu Loco is having a global Jam soon. I have volunteered to do a talk on localisation and a demo we are also likely to give a good go at translation into Irish. (Not me I don’t speak it). 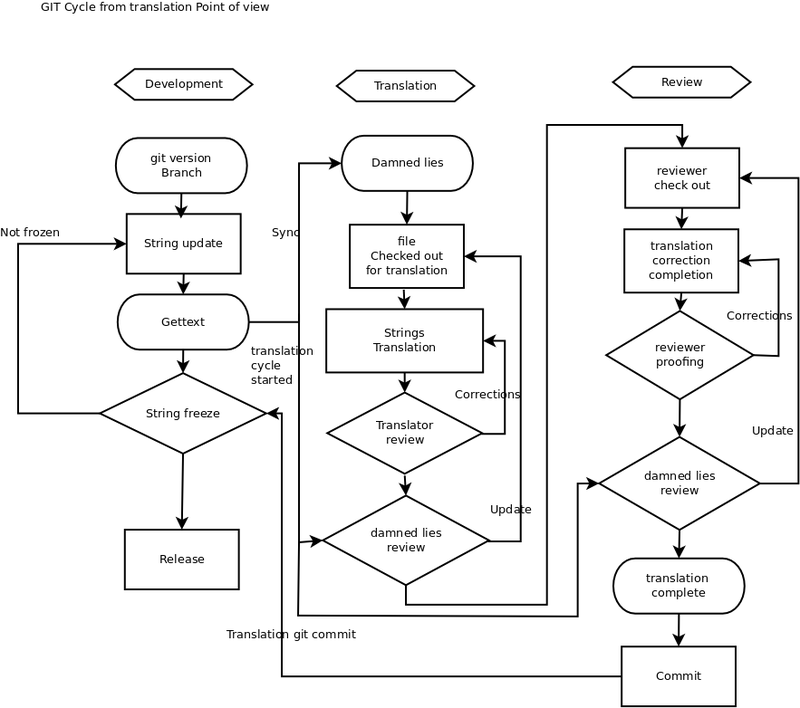 The gnome translation cycle is integrated in the development cycle with damned lies and git. The developers work with git and when translatable text is added (through convention most of it is painless) it is extracted with gettext (for most linux projects). When the git repository PO is updated it is synced with damned lies. If no one works on a translation for a while then it is kept up to date through this method. The file is then reviewed and corrected by separate person. Last in the cycle the file is committed into git; there are a number of people in the gnome translation team who will commit files. The first tree are standard tools that you install and configure, the last one is a portal (meaning you don’t need anything more than a browser). See this for the basics I will expand on it as required. I have only recently stumbled upon OmegaT so will likely only mention it. If you are using any of the first three tools you can test your translation at any stages by compiling / installing the application. For LP You can do so as well if you download the po for yourself after translating. One very useful thing at this stage is: virtualisation I use Virtual box at this stage but there are plenty of alternatives. If you want to know more about what powers translation tools check out some more info on wikipedia. The program breaks the source text (the text to be translated) into segments, looks for matches between segments and the source half of previously translated source-target pairs stored in a translation memory, and presents such matching pairs as translation candidates. The translator can accept a candidate, replace it with a fresh translation, or modify it to match the source. In the last two cases, the new or modified translation goes into the database. Some translation memories systems search for 100% matches only, that is to say that they can only retrieve segments of text that match entries in the database exactly, while others employ fuzzy matching algorithms to retrieve similar segments, which are presented to the translator with differences flagged. It is important to note that typical translation memory systems only search for text in the source segment. The flexibility and robustness of the matching algorithm largely determine the performance of the translation memory, although for some applications the recall rate of exact matches can be high enough to justify the 100%-match approach. Segments where no match is found will have to be translated by the translator manually. These newly translated segments are stored in the database where they can be used for future translations as well as repetitions of that segment in the current text. Translation memories work best on texts which are highly repetitive, such as technical manuals. They are also helpful for translating incremental changes in a previously translated document, corresponding, for example, to minor changes in a new version of a user manual. Traditionally, translation memories have not been considered appropriate for literary or creative texts, for the simple reason that there is so little repetition in the language used. However, others find them of value even for non-repetitive texts, because the database resources created have value for concordance searches to determine appropriate usage of terms, for quality assurance (no empty segments), and the simplification of the review process (source and target segment are always displayed together while translators have to work with two documents in a traditional review environment). Ensuring that the translated documents are consistent, including common definitions, phrasings and terminology. This is important when different translators are working on a single project. Accelerating the overall translation process; since translation memories “remember” previously translated material, translators have to translate it only once. Will add screen shots of basic configuration for the tools then it’s hands on with participants computers as required. Also as current translations are not that good The gnome team is looking for someone comfortable enough to help review the material already translated. With this I believe if you want to get started and keep your interest up in the translation project there are a number of things you can/should do. Set your machine to Irish start doing the things you do. Being familiar with it is important for your language skills. Get started on previously translated material. This will get you some relevant material (or in some cases some not very good translations). I started this way and if you translate something you use regularly you will keep it going. Are you confident enough to review already translated material?